Sunwfayfoto has recently released a second version of a custom Arca-Swiss® compatible Quick Release Modular L Bracket dedicated to the SONY® high end full frame mirrorless α7 and α7R cameras. The design of the new PSL-a7II L bracket differs in many aspects from their original PSL-a7 L Bracket introduced last December which followed a very lightweight design pattern. The newer Mark II model, although a little bulkier and heavier offers quite improved functionality in terms of camera positioning as we shall see further below. 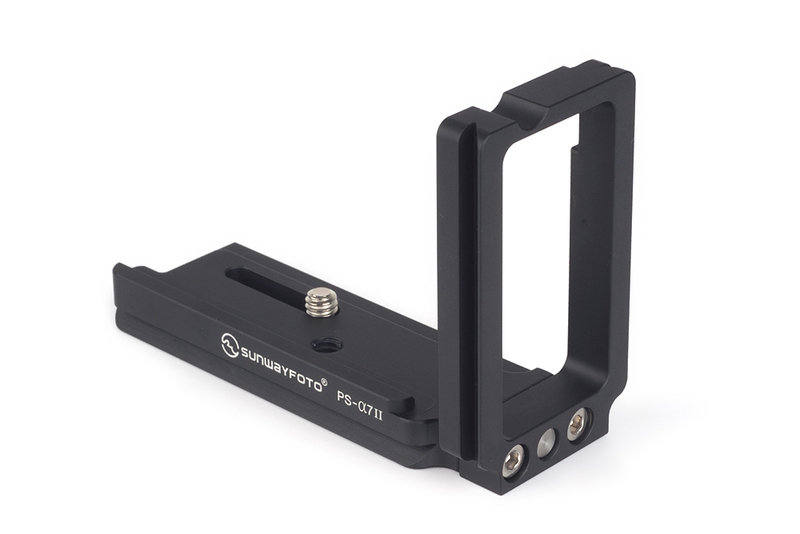 Sunwayfoto PSL-a7II Arca-Swiss® compatible custom modular L bracket is 97 mm long occupying most of the Sony α7's base. One convex ridge on the front act as a stopper and prevents the plate from twisting. The new long base-plate dovetail design allows quite a lot more lateral adjustment compared to the mark I's rectangular shape, while it offers an extra strap loop. Another attribute of the PSL-a7II is that the base plate and vertical side plate dovetails are now aligned. A fact which combined with center Φ marks on both plains proves very functional when changing orientations since no correction in framing will be needed at all. 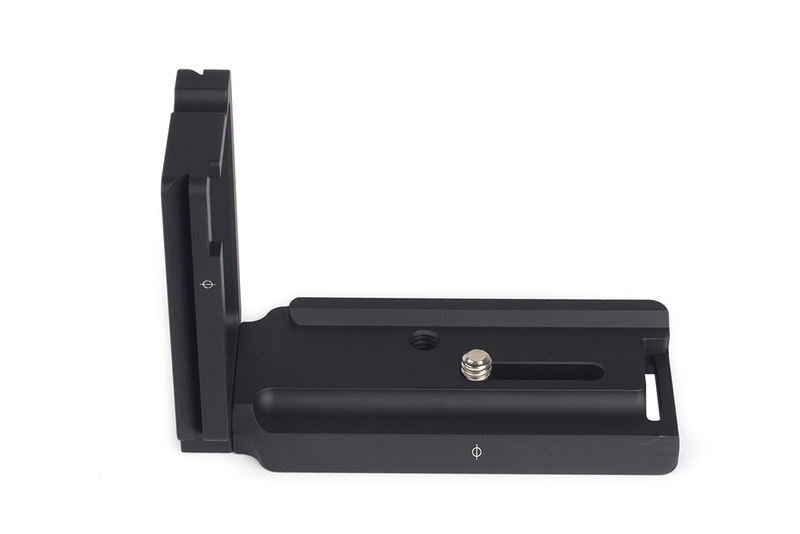 The modular PSL-a7II L bracket comes in two parts, the base plate and the vertical L side, which is attached on the base plate via two M4 hex screws. The L side can be easily attached / detached by the user with the included Allen hex key, if saving some weight is critical. 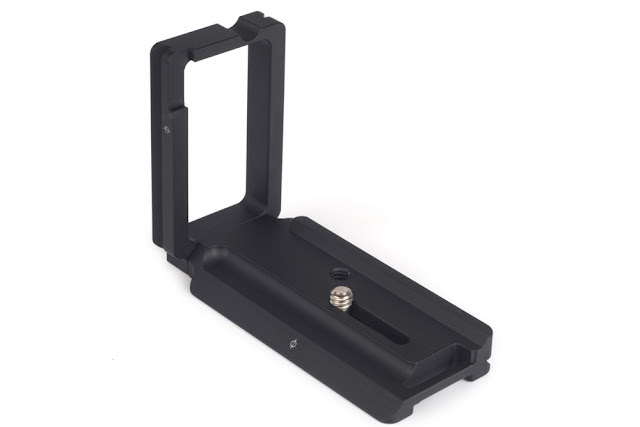 The base plate features one 1/4"-20 hex-socket (but also slotted) captive mounting screw, two M3 safety stop screws and an 1/4"-20 threaded hole for mounting on a pod without removing the bracket. All appropriately sized Allen hex keys for the mounting, stop and side screws are supplied. The PSL-a7 L Bracket fits nicely and embraces the Sony α7 / α7R body adding about 1 cm to the camera dimensions and very little weight. The PS-a7II base plate occupies all the width under the LCD screen, starting from the left edge and stopping just before the battery door hing enabling the unobstructed exchange of batteries.The vertical L side reaches just above the LCD screen, where its small recess on top embraces the strap hook base. As illustrated above, the vertical plate opening permits full access to the camera side connectors. The anti-twisting convex ridge sits against the front panel of the camera, so nothing interferes with the raising and tilting of the LCD screen. 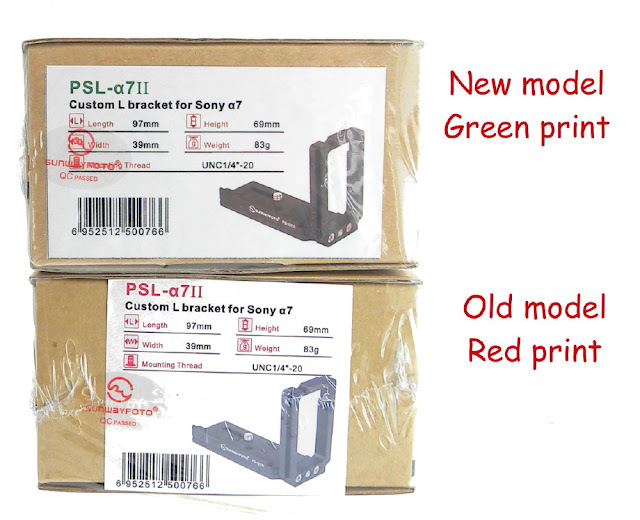 The major difference between the PSL-a7II and the original PSL-a7 L brackets, is that with the latest version the mounting screw can move within the limits of a captive slot on the base plate. This now allows sliding the vertical plate away from the camera side in case large connector jacks are used for e.g. tethered shooting, enabling the user to clamp the camera in portrait (vertical) orientation. 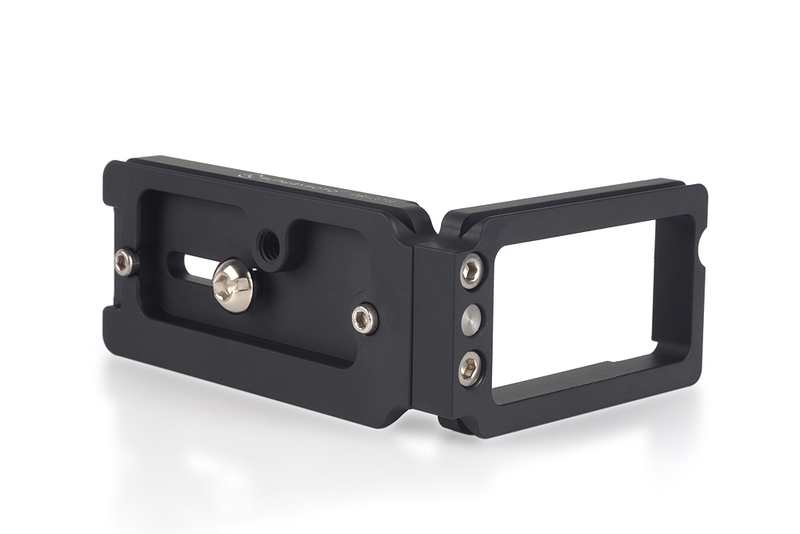 According to information received from Desmond Photographic Distributors, an updated version of the PSL-a7II L bracket has just been released featuring a shallow groove next to the long mounting slot. This groove was added in order to accommodate a small pin that exist at the bottom of the α7/α7R body near the connectors' side, even when sliding the side plate away from the camera side. Further, in order for the new/updated model box to be easily discriminated from the older one, the model number in now printed in GREEN color instead of RED on the box label. Current retail price for the updated PSL-a7II L Bracket is US$ 63.00 (+Shipping where applicable) and is now available from Amazon in Europe and from eBay worldwide. 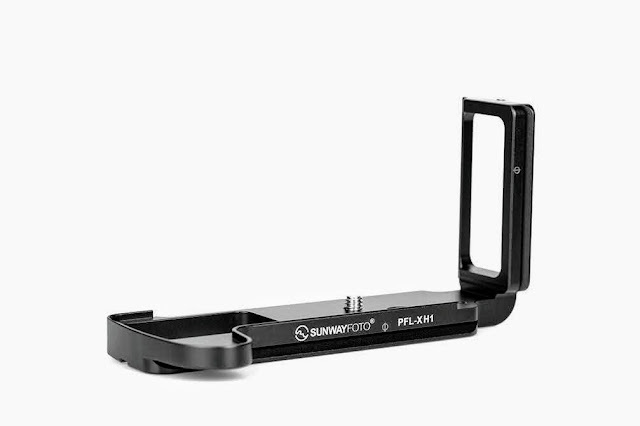 If the above images of this bracket are of the final production product from Sunwayfoto then I would like to point out an apparent very significant flaw in their design. Sony, for unknown reasons, chose to include 4 very small 'standoffs' on the base of the A7 series (~ 2mm Dia. x .5mm tall). There are 3 located around the battery door and 1 directly under the cable access door area, directly inline with the ¼" tripod mounting hole. I see no sign in the images above that Sunway included any 'recess' in the mounting plate to account for the 'standoff'. 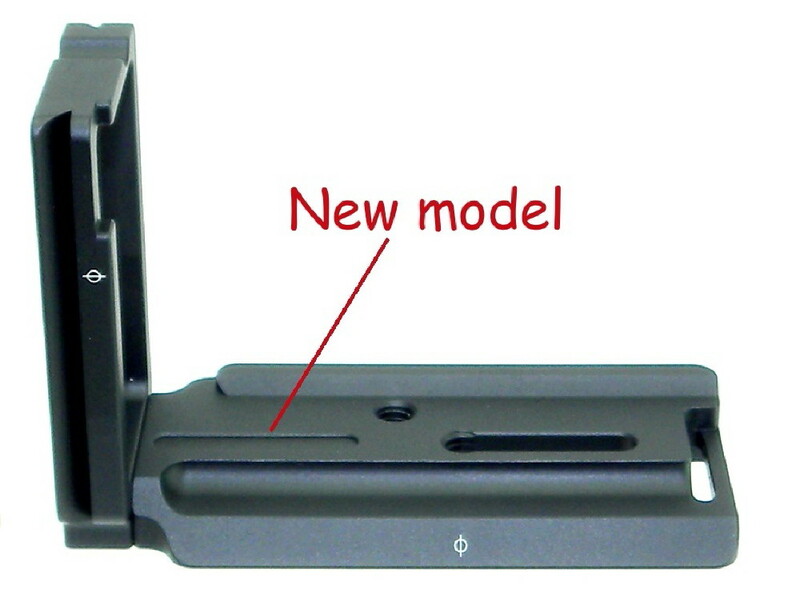 If this is the case then it will cause a very unstable base mount, especially on the left (cable door) side where the camera will not be able to sit 'flat' on top of the mounting plate because of the standoff which makes for a very unstable baseplate to camera connection ( I know from experience ). This issue will only be compounded if used with the 'L' plate in portrait orientation. I hope the photos may be of a preproduction unit, if not Sunwayfoto should be made aware of this important issue. Recesses for these 'standoffs' has surprisingly been overlooked by many 'brand name' plate manufacturers as well as almost all 'generic' vendors designs. Note: This is not an issue for 'standard' mounting plates unless they extend past the last ¼" on the left edge of the base (cable door side) or around the battery door area. Thanks for your observation and your meticulous comment. These "Standoffs" btw most probably serve as alignment pins for the Sony VG-C1EM battery grip but need to have both in hand to verify. After communicating with Sunwayfoto in regard of your comment, I received today an answer that confirms the lack of a recess for the left-most pin (the one near the connector ports as you described) in their first production batch. 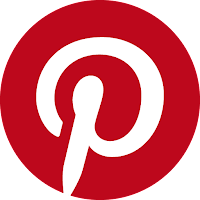 They also informed me that there will be provision for a relief groove for the particular pin on their next batch, which will enable the plate to slide away from the camera body for shooting in portrait orientation with cables plugged. I shall update accordingly, as soon as I have further information and/or photos. 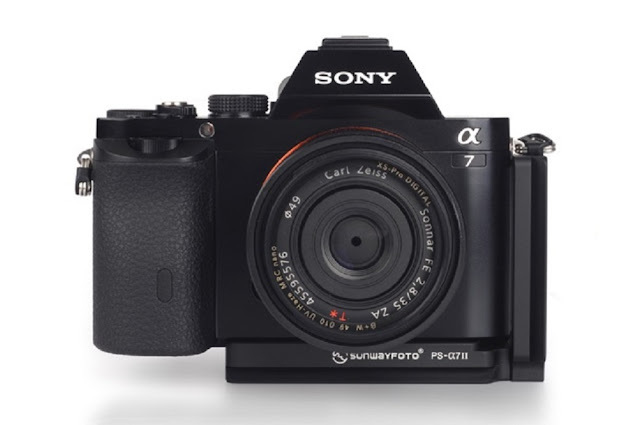 The post has been updated with the new PSL-a7II version which has already hit the stores.